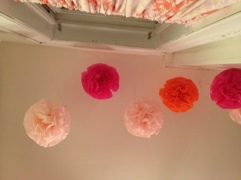 My friend made these wonderful puff balls for her birthday party last weekend. They are super easy with a great payoff. 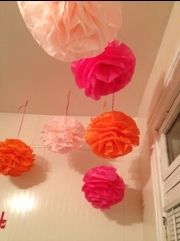 Using 8 – 10 pieces of tissue paper accordion fold and secure the center with a small piece of floral wire. 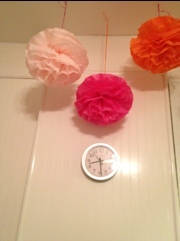 Gently separate the layers of tissue paper to make a ball. 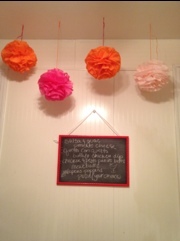 She used contrasting raffia to hang them. I actually laid down on the floor to get the above photo. 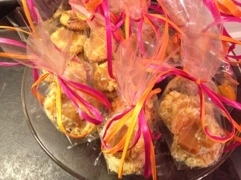 Here’s some more pictures and fantastic parting gifts of salted caramel thumbprint cookies.